An Adam Thielen TD puts Minnesota up 17-3 with 21 seconds to go in the half. Thielen touchdown even fooled the press box announcer who called it incomplete. Cousins dropped it right in the bucket with Darby draped all over his target. 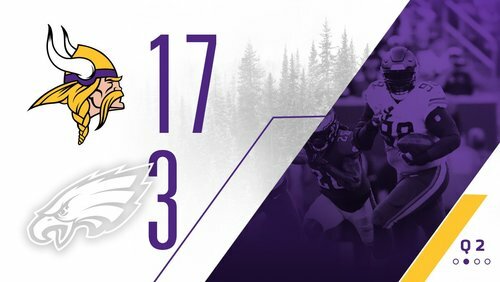 #Vikings take 17-3 lead after the roughing the passer penalty. And Cousins hits Thielen in the corner of the end zone for a touchdown. 16-3 Vikings. Michael Bennett worked Kyle Rudolph on that sack, negated by a roughing the passer penalty that must have been because Bennett went low. They're getting more defensive backs involved early, including Iloka. D-line rotation has been about the same. #Vikings crank up heat on 2nd-7, get Harrison Smith running free at Wentz. Happened a lot, too, for Titans vs. Eagles a week ago. Eric Wilson in the game in place of Anthony Barr to start this series, as well. Stephen Weatherly blew by Lane Johnson to force that fumble. Another impressive play for the third-year man, who's starting with Everson Griffen out. Linval was movin' on that 64-yard fumble return for a touchdown. #Eagles Injury Update: CB Ronald Darby (stinger) will return. It's officially a 63-yard fumble return by Joseph, who had a sack earlier. Big first half for the #Vikings anchor. Vikings go back on top on a fumble recovery for a touchdown by Linval Joseph. They're calling it a fumble for Wentz, not an interception, which means Weatherly gets credit for forcing it. 10-3 Vikings. Bailey good on the extra point. #Vikings lead 10-3 after the second defensive touchdown of the season. That's the Vikings first takeaway since Week 1, and Linval Joseph takes it back for a touchdown. Stephen Weatherly hit Wentz as he threw. Big boy touchdown! Linval Joseph just ran 50-plus yards on a Wentz fumble, leading to the Joseph return for six. Now I want to see Linval Joseph in the backfield, the way they used to use Randall McDaniel. Ajayi and Goedert pick up back-to-back #Eagles ' first downs. 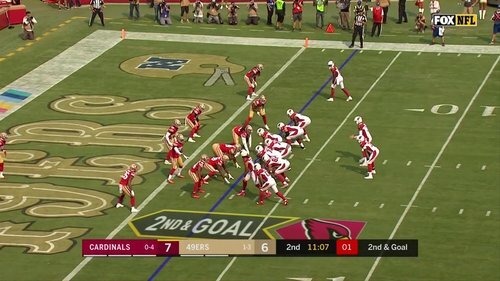 David Johnson for the TD! George Iloka in again as a third safety. #Vikings have played seven defensive backs already. Dan Bailey misses another field goal, this one from 45 yards away. The #Vikings continue to be the Bermuda triangle for kickers. Vikings receivers are getting open on every play. Question will be whether Cousins has time to get it to them. Riley Reiff, who was talking with two #Vikings trainers when he exited the game, watched the rest of the drive from sideline with helmet in hand. 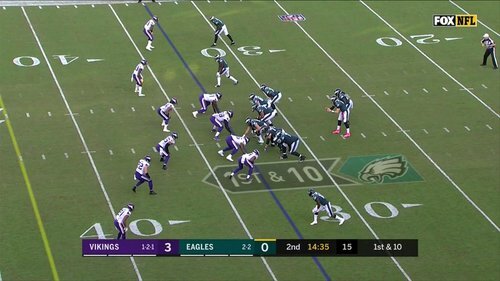 @stefondiggs takes the handoff for 20 yards and moves the #Vikings into PHI territory. Rashod Hill is at left tackle, and Brian O'Neill on the right side with Riley Reiff out. Riley Reiff getting medical attention on sideline. Rashod Hill at left tackle. Brian O'Neill at right tackle. #Vikings have wanted to get Iloka involved in the red zone, didn't pan out vs. Rams (because they scored almost exclusively from 20-plus yards away). PHI ties it up at 3 with 12:24 left in the 2nd quarter. George Iloka was in for that third down. George Iloka in the game on third-and-3. Wentz's pass goes off the hands of Smallwood. #Vikings hold Eagles to a FG attempt. Carson Wentz stands comfortably in the pocket on that 48-yard strike to Shelton Gibson. The latest big play vs. this #Vikings defense. And just as I say that ... they complete a 48-yard pass. 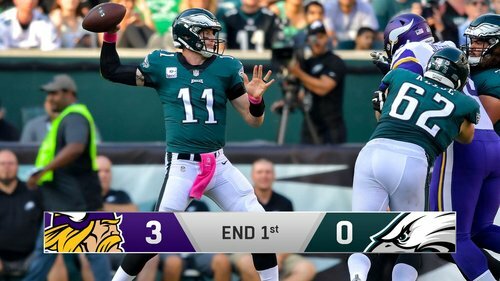 Vikings have 103 yards of offense; Eagles have -4. Eagles have run six plays for minus-4 yards in first 15 1/2 minutes. #Vikings kept 7 in protection to start that dropback, Kirk Cousins is still sandwiched by Eagles D-linemen. They're overmatched if Cousins needs a dropback longer than a few seconds. Rashod Hill is not having a good day. Rashod Hill got whipped on Murray's run for no gain, and Brandon Graham blows by him for a sack. 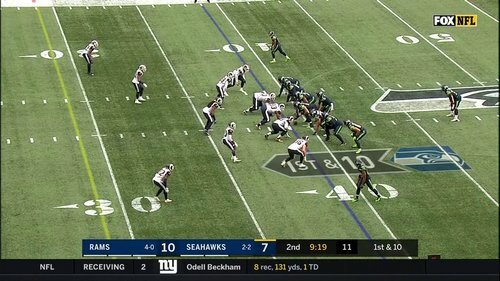 Third and 13. That's what Treadwell should be able to contribute - tough third-down catch, hard running to the sticks. #Vikings defenders staying disciplined on misdirection plays to start this one. Barr and Hunter corral Wentz's flip to the running back on 3rd-short.